I am so excited to share a Living Room Design project that we just wrapped up. We've been very busy in the design studio. Over the holidays, I took some time off from posting about design projects to focus on seasonal decor posts. This means I have a whole bunch of brand new designs waiting to be shared. In this project, we created a fresh, comfortable living room for Amy's gorgeous home. We gave her a beautiful new room design that incorporated some of the nuetral colors that she loves, adding a pop of red that was found in other areas of her home. We did this to maintain a nice flow throughout the main level. 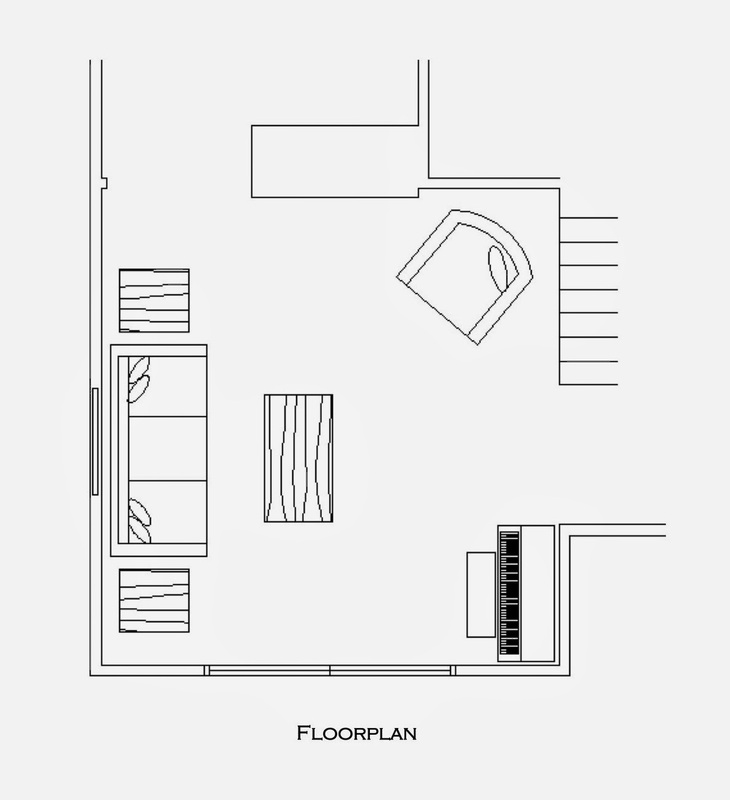 You can see in the true-to-scale floor plan illustration above that the living room is adjacent to the foyer, so we included a suggestion for a round foyer rug that coordinates with the living room design. I fell in love with this gorgeous indoor-outdoor rug for it's modern floral design and gorgeous color scheme, not to mention the practicality of using an indoor-outdoor rug in a foyer. I knew the moment I saw it, I had to add it to my collection. 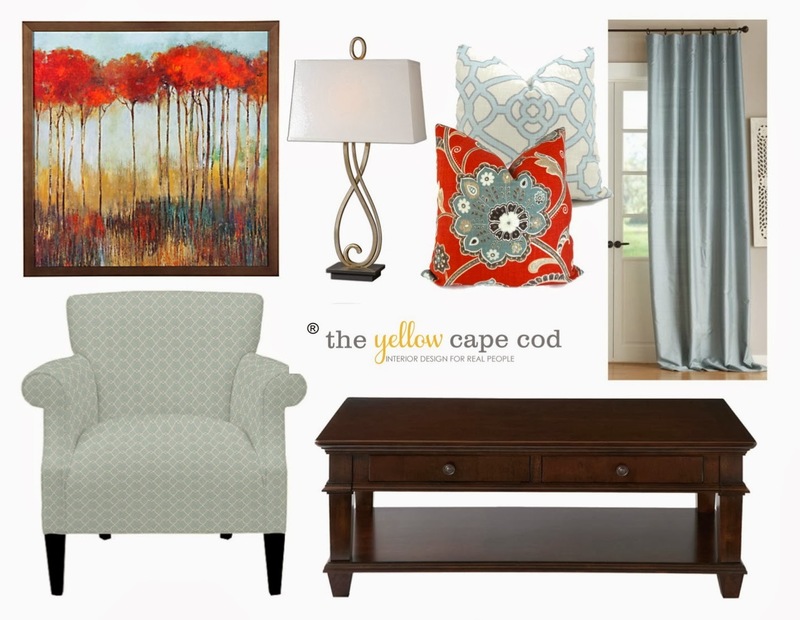 Another really exciting thing happened over the holidays, The Yellow Cape Cod Collection of home decor is now available in my brand new online interior design boutique. Click Here to visit. 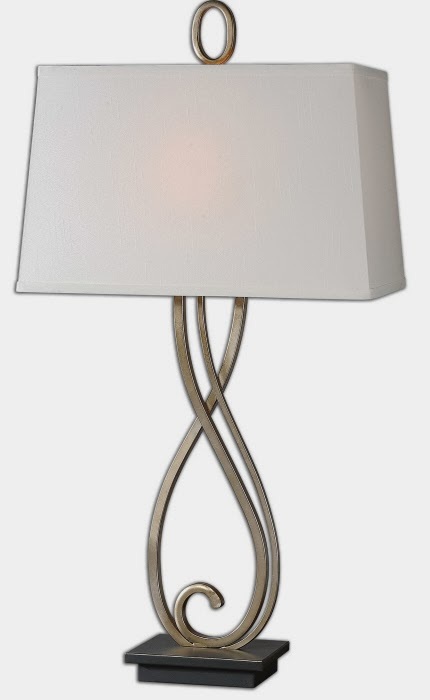 You can also find these stunning, large scale scroll lamps in my shop. The seductive soft curves of the base combined with the structured shade provide a stunning decorative element as well as ambient light. 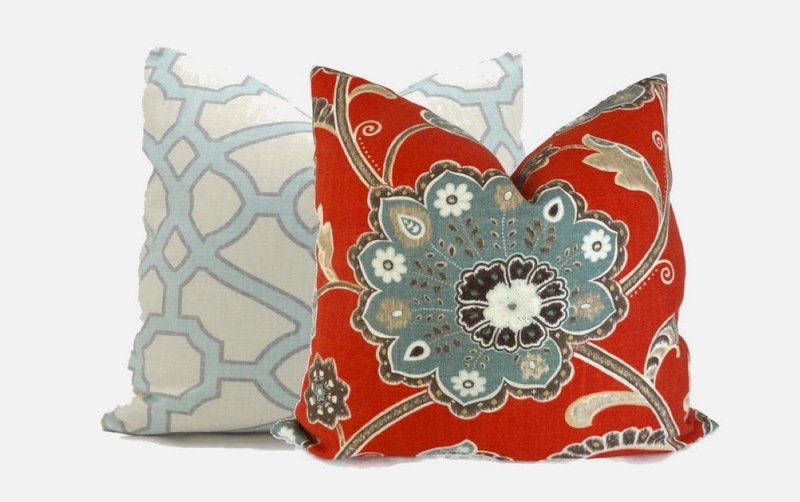 We gave Amy a recommendation for fun patterned pillows found on Etsy. They are the perfect companions to the colorful art we suggested for her space. Sumptuous blue silk drapes, her existing tan sofa, dark wood tables and a soft blue upholstered chair finish off the space. I'd like to invite you to stop by my new online design boutique often. I'll continually add pieces to the collection as I uncover more fabulous, high impact home decor. Only my favorite pieces are available in this shop. There are limited supplies of each item and inventory will change often. I LOVE LOVE LOVE the rug! 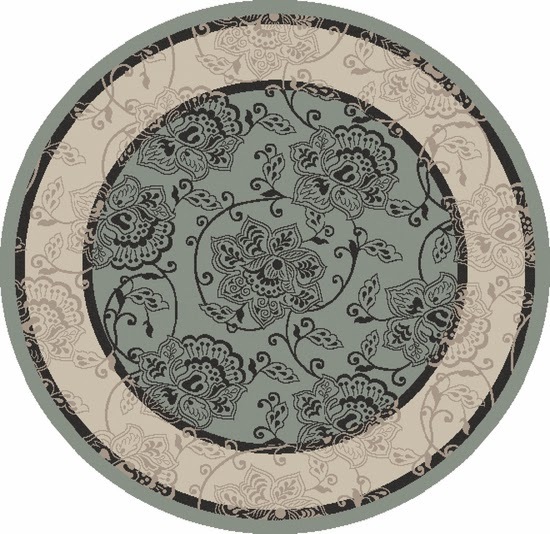 Just this morning I was looking at every rug I could find online to fill a space in my foyer. This one is PERFECT! I just ordered it. Thanks so much for offering such a pretty piece. Beautiful! Love that you are doing the boutique. 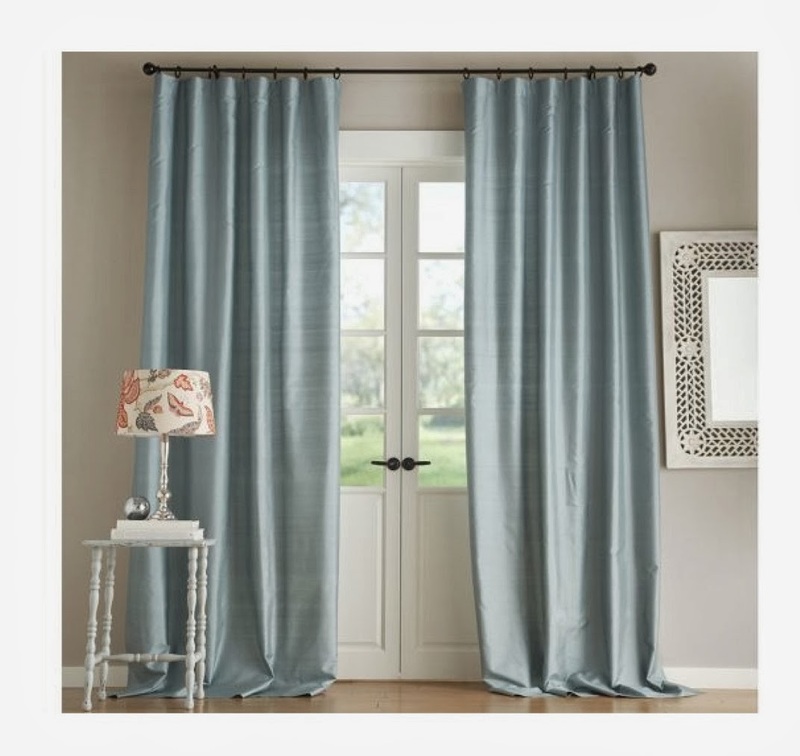 These are the colors I just went to in my home. I wanted calm, natural, restful. My paint is Rocky Mountain Sky by Behr 720E-3. I am lovin' it! Your work is gorgeous and I look forward to every post. Beautiful! Where can I find the coffee table?